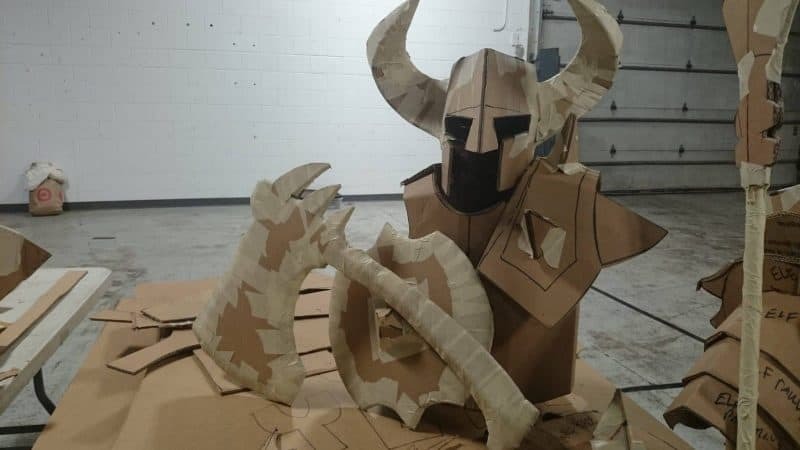 Adventures in Cardboard can visit your school for short, fantastic take-home projects. We aim to open pathways to spatial awareness in exploring how cardboard can be draped, bent and faceted, layered and built up, and crafted into all sorts of sculptures, costumes, and properties. A Shield Project where kids design and build their own shield and heraldic insignia. Any other project you know your students will enjoy and benefit from. Helmets, wands, gauntlets, hats, etc... or if you wish, swords! We provide all cardboard and necessary supplies. We recommend 2 hours for a workshop visit (with a minimum of 90 minutes). If you’d like time to get outside and play, we can add another hour to play some of our favorite team building games. If you'd like to try any of our Safe Sword Tag games, Adventures in Cardboard will provide cardboard taggers if that is not part of your building activity. Regardless, we'll make sure all swords stay in our hands or yours until it's time to play or head home. We have many talented artists, we do many, many different projects, and we love to collaborate. Let’s talk!